Italy reached a new low in its woeful Six Nations history by losing at Scotland 33-20 for an 18th straight defeat in the championship, breaking a century-old record. 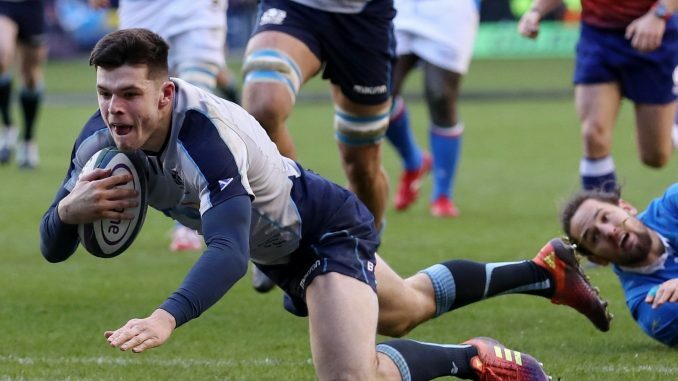 Blair Kinghorn scored a hat trick of tries as the Scots recorded a bonus-point win at Murrayfield to start a tournament in which they are expected to be competitive for the first time in this century. Italy, already, look consigned to a fourth consecutive wooden spoon for finishing last in the standings. With this loss, the Azzurri left behind the France team of 1911-20 that delivered 17 consecutive losses in what was then the Five Nations. Six Nations chiefs continue to dismiss calls to enlarge the competition to seven teams, perhaps adding a 13th-ranked Georgia team that is two places higher than Italy in the world order, or to introduce promotion and relegation to give motivation for the lower-ranked European countries. In those 18 straight Six Nations defeats, the Italians are averaging more than 40 points conceded per match. They made the score more respectable in the Scottish capital by scoring three tries in the final nine minutes — through Guglielmo Palazzani, Edoardo Padovani and Angelo Esposito — when Scotland was down to 14 players following the sin-binning of replacement prop Simon Berghan. Still, it was hardly the way for Sergio Parisse to celebrate playing in a record 66th Six Nations game. Scotland won a seventh straight home match in this tournament for the first time since a run of eight victories in 1975.